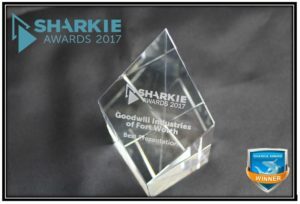 FORT WORTH, TEXAS (June 7, 2017) — Goodwill Fort Worth, a not-for-profit leader in job training for individuals with disabilities and other barriers to employment, was recognized for a “Best Presentation” award in the 2017 Sharkie Awards. The awards program, hosted by Brainshark, Inc., a leading provider of SaaS-based sales enablement solutions, honors outstanding content and sales enablement success stories from the past year. This year’s winners were selected for going above and beyond in their use of sales enablement technology to impact their businesses. Goodwill Fort Worth was named a winner in the “Best Presentation –Training” category for producing the most creative training presentation using Brainshark. A gallery of all the winning presentations is available at www.brainshark.com/gallery. 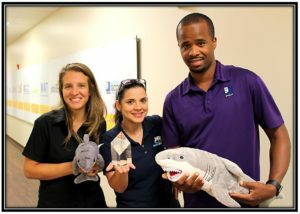 For a list of all of this year’s Sharkie winners, visit: www.brainshark.com/resources/sharkie-awards. Brainshark sales readiness software equips businesses with the training, coaching and content creation capabilities to achieve sales mastery and outsell the competition. With Brainshark, companies can: prepare sales teams with on-demand training that accelerates onboarding and keeps reps up-to-speed; validate readiness with sales coaching that ensures reps master your message; and empower sales organizations with rich, dynamic content that can be created quickly and accessed anywhere. Thousands of companies – including more than half of the Fortune 100 – rely on Brainshark to identify and close performance gaps, and get better results from their sales enablement initiatives. Learn more at www.brainshark.com.